Nanaimo Fire Rescue wants residents of Nanaimo to be as prepared as possible in case of a structure fire, and that begins with smoke alarms in the home. "You have less than 3 minutes to escape a house fire. Don't rely on outdated smoke alarms to keep your family safe." These are powerful statements that stand out on the cover of one of Nanaimo Fire Rescue's safety brochures. Public awareness around smoke alarms is one of the team's objectives, and the motivation behind a new door-to-door campaign that will have firefighters educating residents and checking smoke alarms in downtown neighbourhoods. Karen Fry, Nanaimo's new Fire Chief, says that statistically "in the downtown area, the percentage of working smoke alarms in residential fires was only 18% between 2012-2015. 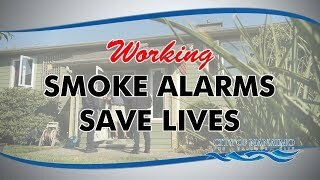 This is the highest-risk area for non-working smoke alarms in the city, and Nanaimo Fire Rescue needs to be sure that we do everything we can to provide the occupants with enough time to evacuate safely if they do have a fire." With Nanaimo Fire Rescue, the message is clear. Check your smoke alarms monthly. Change the batteries in your smoke alarms every six months. And change your smoke alarms every ten years, as they are only designed to have a ten-year life span. The door-to-door campaign begins in downtown Nanaimo in October 2017. The City of Nanaimo and Nanaimo Fire Rescue have created a video to emphasize the new campaign. View it online at www.Nanaimo.ca, or on the city's Facebook page (City of Nanaimo Local Government).